is one the world's leading brands for desks, workstations, chairs, tables, and storage. HON is consistently rated as one of the most comfortable, best designed office furniture manufacturers in the world. Through its innovative design style, the various furniture collections like Basyx by Hon have become the popular choice among image conscious businesses. Surprisingly, considering the level of quality, HON's furniture very affordable, and bring a durability that few manufacturers can match. The HON Company is a leader in the design of workplace furniture including office chairs, storage, panel systems, tables, and desks. The Ignition collection has been applauded for truly innovative design and comfort. HON understands that people come in a variety of sizes, and their furniture is comes with size options to make comfort a certainty. Along with style and innovation, HON believes in the integration of safety into environmental philosophy and policies. One of the company's main goals is to increase safety while also reducing the impact on the environment. Individual responsibility is fundamental, and based on the knowledge that everyone at HON can impact the environment. "Green" is not simply trendy for the company. It's a part of the Hon furniture culture and the way the company does business. 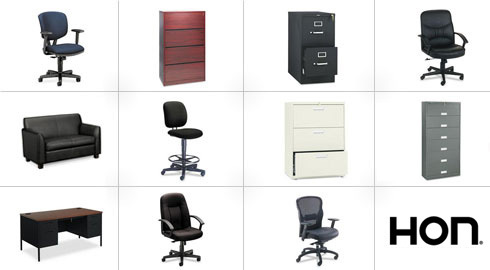 ReStockIt.com is proud to offer a wide range of HON office furniture. We even offer free shipping on top sellers! We're confident you'll love HON's affordable, stylish designs and environmentally friendly approach to business.